Reference number for this case: 16-Oct-54-Wissembourg. Thank you for including this reference number in any correspondence with me regarding this case. The regional newspaper L'Alsace for October 19, 1954, reported among other observations that day, that in Eguisheim, on October 16, 1954, at 09:20 p.m., "a flying saucer flew at low altitude, in a burst of sparks, on the Stanislas hospital in Wissembourg. The craft was seen by the local police and residents." The two authors report that in Wissenbourg in the department of the Bas-Rhin, on October 16, 1954, several people saw a shining machine having the shape of a melon and leaving a trace of orange white color. "Wissembourg - 67 - 09:20 p.m.: no investigation. Enters in the category of the sparse cases." Among briefly mentioned cases for this date, he indicates that on October 16, 1954, at 09:20 P.M., residents and the city police of Wissembourg saw a flying saucer fly above the Stanislas hospital at low altitude while producing many sparks. Christian Valentin points out that the observations auround 09:30 P.M. at this date can probably be of the splendid meteor which was seen from a score of departments of the north-eastern quarter of France. Although Aimé Michel explained that meteor in his 1956 book, nor Figuet and Ruchon neither Barthel and Brucker seemed to have understood that it was just that. 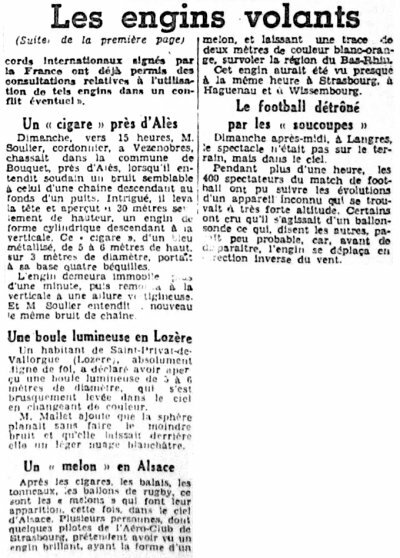 [lm1] Article in the regional newspaper Le Méridional, page 10, October 19, 1954. 3.0 Patrick Gross April 29, 2014 Additions [la1], [cv2], Summary, Explanation that were previously "Not looked for yet. The October 16, 1954, 09:30 p.m. meteor."